Sterling silver has a lovely glow, but we’ve probably all experienced pulling a favourite sterling silver item out of our jewelry box, only to discover it has tarnished. But the good news is, it can be polished up with no harm done. Special care is needed with intentionally oxidized or patinated finishes (but more on those in a moment). Because sterling silver is the same material right to the core, you can polish away without worrying about all the silver coming off (as it would with a plated item). Before we talk about preventing it and removing it, it’s good to understand what it is. Tarnish is the darkening of some metals when a chemical change occurs on the surface. Tarnish ranges in color from a yellowy-gold to absolute black. It can happen when silver (or brass, copper, aluminum and some other metals) come in contact with air, moisture or certain chemicals. It’s not actually the silver that is tarnishing: it’s the copper that’s in the sterling silver (which is an alloy of 92.5% pure silver, and 7.5% other metals, predominantly copper). Higher content silvers, like fine silver, which is 99.9% pure silver, tarnish more slowly, if at all. wear your item often! Oils from our skin help ward off tarnish. keep your jewelry away from perfumes, lotions, and hairspray. Put your jewelry on last! remove your jewelry when swimming, bathing, and doing household cleaning. protect your item from air and moisture by storing in a plastic zip-lock bag, or by covering in anti-tarnish fabric. 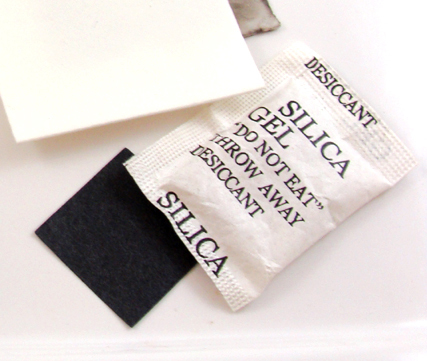 The idea is to keep the item away from air, as well as moisture, so anti tarnish strips, chalk or even those little packs of silica gel can be tossed into the bag. store your jewelry in individual bags, to keep them from scratching each other, and from tangling. 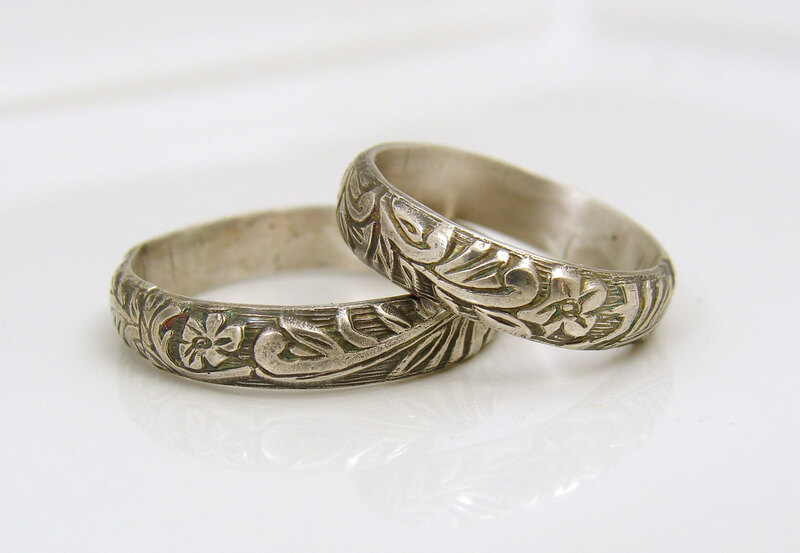 do not store silver in direct contact with wood, as it might have been chemically treated. do not wrap your silver in plastic cling wrap. Sunshine polishing cloths are great! This one looks pretty dirty, but it has a LOT of life left in it! use a silver polishing cloth, such as a Sunshine polishing cloth . you can electrochemically reverse (non-destructively) tarnish by resting the objects on a piece of aluminium foil in a pot of boiling water with a small amount of salt or baking soda. Each piece must be touching the foil for this to work. make a thick paste with 1/4 cup baking soda and two tablespoons of water. Apply with a damp sponge, then rinse and dry. make a paste of corn starch and water and apply with a damp cloth. Let dry, then rub off with something mildly abrasive, like a rough towel. if you want to get into the cracks and crevices, use an old toothbrush. I hear you can use other things, like ketchup, toothpaste, lemon juice and salt but I haven’t tried any of these. Rings with a patina. Don’t clean these with a liquid or a toothbrush! 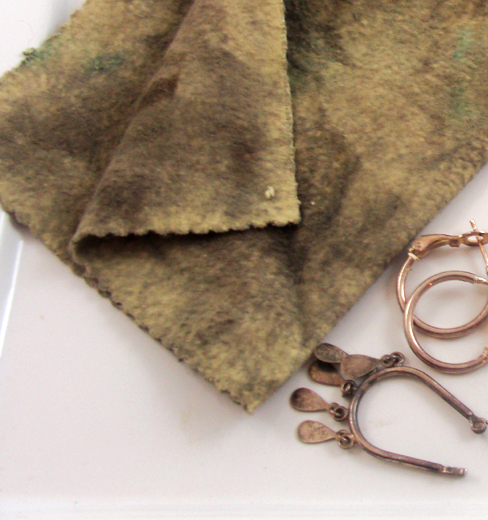 liquid cleaners and brushes can remove the oxidation, so if it was part of the item’s beauty, don’t go there! Just polish the surface lightly with a silver polishing cloth and avoid getting into the crevices.